177 Commonwealth is located on the north side of Commonwealth, between Dartmouth and Exeter, with 175 Commonwealth to the east and 179 Commonwealth to the west. 177 Commonwealth was designed by Snell and Gregerson, architects, and built in 1882 by Webster & Dixon, builders, as the home of John Quincy Adams and his wife, Fanny Cadwallader (Crowninshield) Adams. He is shown as the owner on the original building permit application, dated April 7, 1882. They also maintained a home, Mt. Wollaston Farm, in Quincy. Fanny Adams purchased the land for 177 Commonwealth on October 9, 1874 from the Commonwealth of Massachusetts. It originally was a 28 foot wide lot, but on December 29, 1874, she sold the eastern one foot to Charles Merriam, who combined it with his lot and built his home at 175 Commonwealth on it. Click here for an index to the deeds for 177 Commonwealth. John Quincy Adams, the grandson of President John Quincy Adams, was a lawyer and served as a member of the Massachusetts House of Representatives. A Democrat, he was an unsuccessful candidate for Governor in 1868, 1869, and 1870. In 1872, he was nominated for Vice President by a faction of the Democratic party that refused to support Horace Greeley. John and Fanny Adams’s four surviving children lived with them: George Caspar Adams, Charles Francis Adams (called Charles Francis Adams 2nd to distinguish him from his uncle, Charles Francis Adams, Jr.), Arthur Adams, and Abigail Adams. John Quincy Adams died in August of 1894. Fanny Adams and their children continued to live at 177 Commonwealth and in Quincy. Charles Francis Adams 2nd, a lawyer, married in April of 1899 to Frances Lovering; after their marriage, they lived in Concord. George Adams died in July of 1900. From the 1899-1900 winter season through the 1904-1905 season, Fanny Adams, Arthur Adams, and Abigail Adams spent their winter seasons elsewhere (probably in Quincy) and 177 Commonwealth was the home of Clarence Seymour Wadsworth and his wife, Katharine Fearing (Hubbard) Wadsworth. He graduated from Harvard Law School in 1900. Their primary residence was in Middletown, Connecticut, and they probably only lived in Boston during the winter seasons (they were listed at 177 Commonwealth in the Blue Books but not in the City Directories). 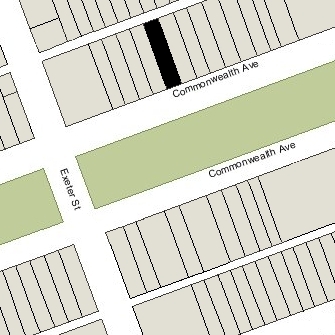 The Adamses may have lived at 177 Commonwealth when the Wadsworths were not there (the Adamses were listed at 177 Commonwealth in the City Directories but not in the Blue Books). 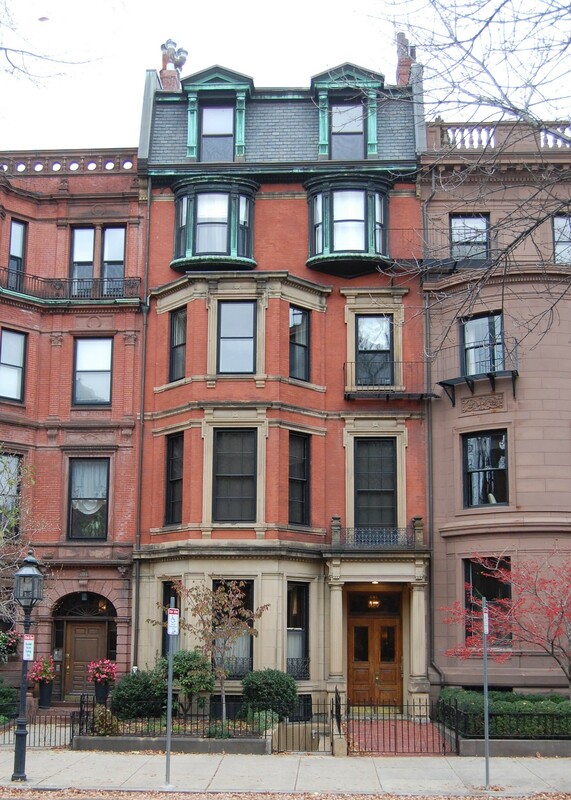 By the 1905-1906 winter season, Fanny Adams, Arthur Adams, and Abigail Adams were once again living at 177 Commonwealth. Abigail Adams married in June of 1907 to Robert Homans, a lawyer; after their marriage, they lived at 158 Mt. Vernon. Fanny Adams died in May of 1911 and 177 Commonwealth was inherited by her three surviving children: Charles Francis Adams 2nd, Arthur Adams, and Abigail (Adams) Homans. After his mother’s death, Arthur Adams moved to 140 Beacon. He was a banker and trust company officer. By the 1911-1912 winter season, 177 Commonwealth had become the home of Charles Francis Adams 2nd and Frances (Lovering) Adams. They previously had lived at 229 Beacon. They also maintained homes in Concord and in North Scituate. On June 18, 1914, he acquired his two siblings’ interests in the property. Charles Francis Adams was a lawyer and treasurer of Harvard. He later would serve as Secretary of Navy in the Hoover Administration, and then as Chairman of the Board of the State Street Trust Company. The Adamses lived at 177 Commonwealth until about 1929, when they moved to Washington DC when he was appointed Secretary of the Navy. During the next three winter seasons, 177 Commonwealth was the home of Mabel Florence (Smith) Wolfe Baldrige, the widow of coffee merchant Dudley Wolfe and estranged wife of Omaha insurance broker Joseph M. Baldrige. Dudley Francis Wolfe, her son by her first marriage, lived with her. They previously had lived at 78 Beacon. She also maintained a home, Warrenton Park, in Rockland, Maine. By 1934, Mabel Baldrige (and probably Dudley Wolfe) moved to 166 Marlborough. In 1939, Dudley Wolfe died while attempting to climb K-2, the world’s second highest mountain. After Hoover’s defeat in 1932, the Adamses returned to Massachusetts and had resumed living at 177 Commonwealth by the 1933-1934 winter season. Charles Francis Adams died in June of 1954. 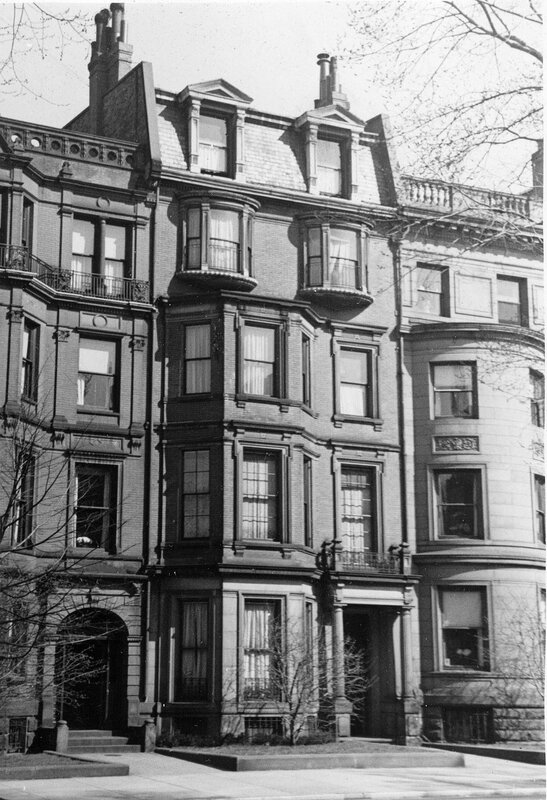 Frances Adams continued to live at 177 Commonwealth until her death in April of 1956. On September 19, 1956, 177 Commonwealth was purchased from Frances Adams’s estate by Maurice M. Traynor (born Meyer Cohen) and his wife, Ruth Ida (Hurwitz) Traynor. They lived in Brookline and operated Traynor’s Flowers at 47 Newbury. On November 6, 1957. 177 Commonwealth was purchased from the Traynors by the Church of Jesus Christ. It had owned 175 Commonwealth since 1940 and maintained offices and lodgings there. On December 2, 1964, 177 Commonwealth was purchased from the Church of Jesus Christ by Nick Haddad, trustee of the Haverty Realty Trust. The deed specified that, as long as the church continued to own 175 Commonwealth, 177 Commonwealth could be used only as single-family or multi-family residence and not as a rooming, guest or boarding house, or dormitory, or for institutional, business or commercial purposes. That same month, he filed for (and subsequently received) permission to convert the property into twelve apartments. On October 13, 1969, the building was severely damaged by a fire in which several people were seriously injured. In April of 1970, Nick Haddad was found guilty of failing to have an operational sprinkler system and fined $300. On February 5, 1979, 177 Commonwealth was purchased from Nick Haddad by Leonard F. Conway, Jr., and John V. Cunney, Jr. On September 20, 1979, they converted the property into nine condominium units, the 177 Commonwealth Avenue Condominium. In November of 1979, they filed for (and subsequently received) permission to reduce the legal occupancy of the property from twelve units to nine units to conform with the condominium documents.